Knowing when to bring your car in for repairs is harder than people think. We can’t count the times clients have skipped an automotive repair when really they should have brought their car right into the shop. So for those of you who struggle knowing when it’s time for an automotive repair, and when it’s not, we at Southport Automotive have put together this handy guide for you. Let’s jump in! Grinding: Your car shouldn’t make sounds that remind you of that scene in Titanic when the ship, you know, crashes into the iceberg. Clunking/thumping: If you hear a sound and think “Huh, something sounds loose”, chances are something it loose and swinging free. Take your car in immediately. Squealing: Usually a sign that a belt is loose or damaged in some way. Now, there is quite a few other sounds that mean you may want to go get a repair, but these are just the top few. We encourage everyone to use their best judgment. 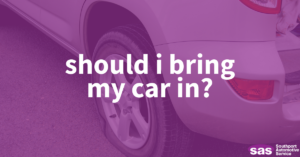 If a sound escaping from your car is making you nervous, it’s best to bring it in to be sure. Now smoke pouring from your engine is instinctually terrifying. Smoke usually equals bad. When it comes to your car, that is positively true. Blue Smoke: Oil is escaping from where it’s supposed to be and being burned up. White Smoke: Water or coolant has mixed with the fuel. Or you forgot to fill the coolant reservoir. Hopefully not. But best to have it checked anyway. Never ignore smoke. Safety first. Now, these are just a few examples of important reasons to bring to an automotive repair. At Southport Automotive, we know how busy life can get, but keeping your car running well is a key to keeping yourself and those you love safe in this hectic world. So when your worried about your car, don’t delay, bring your car in for maintenance and repairs your can trust.